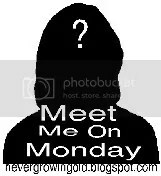 One of my favorite memes, because it is quick and easy, is Meet Me On Monday! If you want to participate or read the other poster’s answers just click the icon! 1. Nope I have never won first place in anything that I recall. 2. MOST of the time my toes are painted but not lately, just have not had the time. 3. My eyes are grey, though a friend has seen them actually change color to a deep blue and then back to grey, while he was looking at them. My emotions seem to dictate that. 4. To my left is the boss’s desk across the office from mine and the door out to the shop. 5. SOFT cookies, fresh from the oven, still gooey and warm!!!! 1. Yes, but only silly wins. Bubble blowing contest when I was 7, kite building contest at 9, hula-hoop contest at 9…see? silly stuff! 2. Typically only paint my toe-nails for special occasions and then a neutral pink. 3. I have green eyes. 5. Crunchy , but ginger snaps and windmill cookies are the only ones I’ll touch and they are by definition crunchy, aren’t they?